6/0 Orange PRECIOSA Cornelian Star. This is a new type of rocaille containing a combination of glass types. A cornelian is a rocaille with a round hole, an intermediate layer of white chalk with a rounded edge and a lining of transparent glass. The PRECIOSA Cornelian Star is a new type of cornelian which includes an intermediate layer in the shape of a six-pointed star. The points of the white core filter through the colored transparent lining and its shadows give the impression of fine stripes. 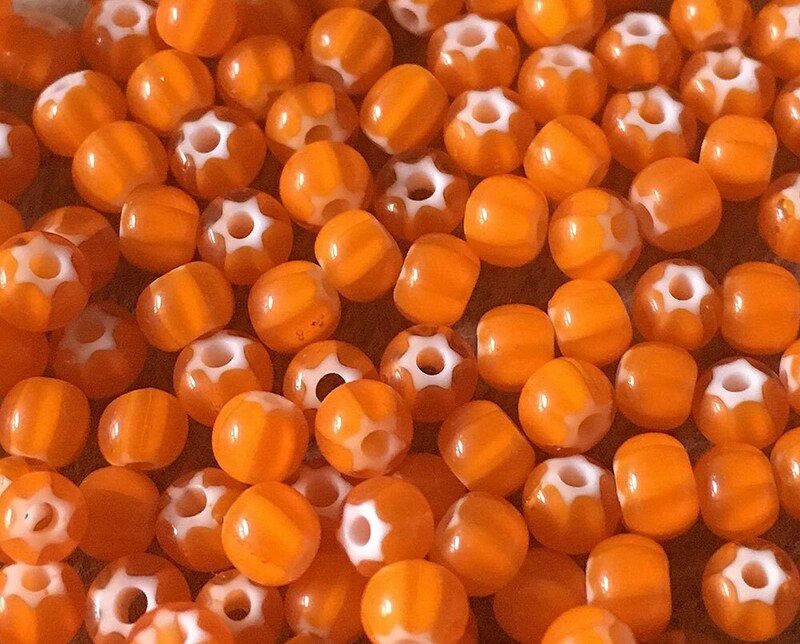 These beautiful beads are available in colors of yellow, orange, red, purple, blue, turquoise, green and black. An interesting shadowing effect is created on the surface of the larger sizes.An interesting shadowing effect is created on the surface of the larger 32/0 size we carry - https://www.etsy.com/shop/southpassbeads?ref=hdr_shop_menu&search_query=32%2F0. 12 grams of beads per 2.5 inch tube, about 200 beads per tube.